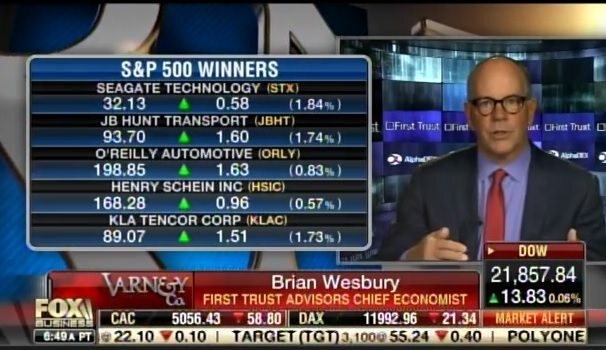 Brian Wesbury joined Stuart Varney Friday morning on Varney and Co. to discuss the Trump economy. Wesbury argued that the stock market will see great gains in the next two years. Brian Wesbury: Right now under President Trump we are not adding regulations we are rolling back some and I expect we are going to roll back more… The number one cause of recessions in the Federal Reserve. When they raise rates too much, when they tighten monetary policy too much. Right now the fed has $2 trillion of excess reserves in the banking system and until they get them out they are not going to be running a tight monetary policy. I would say the odds of recession are extremely low… I’m looking at 40% gains in the stock market.